At one point in time, a recognizable brand was all that was needed for a business to thrive. But now, that brand must be accompanied by trust because modern consumers are different than they were several decades ago. Today, there's the internet and consumers can easily conduct research on a brand before they make a purchase. In fact, they often do. Some stats suggest that 61% of consumers read reviews before they complete a purchase. They look for a reason to trust your brand before investing their hard-earned money in your product or service. 62% of Americans actually believe corruption is widespread in corporate America, so it's safe to say that trust in corporations and big brands is lacking. Companies need to be careful so that they earn a trusted reputation. But there are also great opportunities to amplify what consumers are saying online to build trust for your brand. 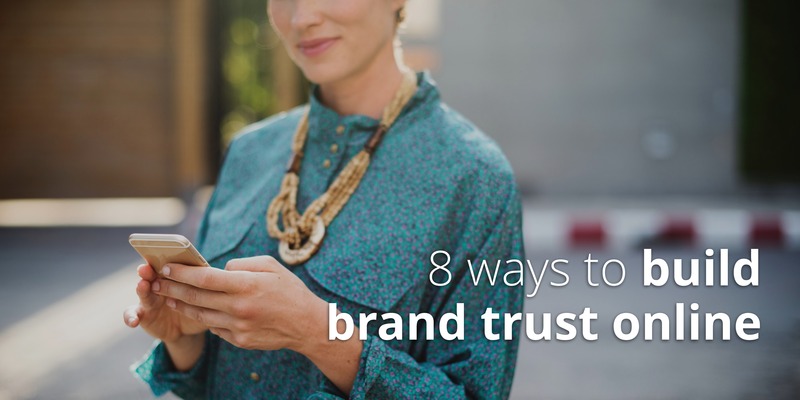 Here's some ways you can build brand trust online. As the saying goes: content is king. Quality content can do a lot for a company, whether it's on your website, blog or social media. It sets you up as an authoritative voice and, hopefully, a thought leader. To write content that will benefit your brand, do some research to see what your competitors are doing. Then, create content that fills in the gaps they've left. Make your content more detailed, engaging and better in any way you can. This will prove you are the authority in the industry. Keep in mind the 80/20 rule for your content creation: 80% of your content should be useful and non-promotional while the other 20% can talk about your product. This will engage consumers and prove to them that their wants and needs are a priority for you. Keep this in mind when posting to social media, writing a blog post or creating a video. By providing reliable and insightful content, rather than a sales pitch, you'll nurture a sense of trust in your brand. Dove's viral campaign "Dove Real Beauty Sketches" is an excellent example of this concept. Most of the video is about how women perceive themselves. The ad doesn't mention Dove products, it simply finishes with the brand's logo as a reminder of the company behind the message. 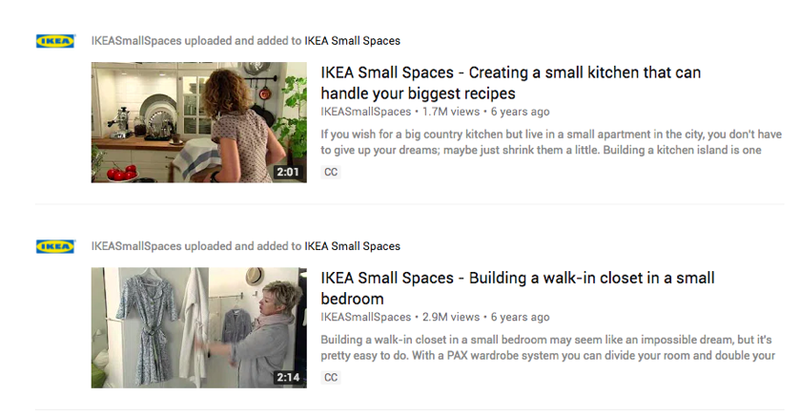 IKEA is another example of a company creating useful content. The authentic Swedish brand added to its trusted reputation with its "Make Small Spaces Big" campaign, which provided tips and creative ideas to make better use of small spaces... information that is both valuable and relevant to its audience. Consumers today like to be engaged and have relationships with brands. If you can do this, you'll build trust. Social media is a way for modern companies to respond personally to individual consumers, and by doing so, these companies contribute to their own mouth-to-mouth marketing. One consumer impressed by a company's communication can quickly go viral and generate positive press coverage. To engage customers successfully, you need to interact with them on a regular basis. You must have a solid, active presence on social media. You need to monitor your pages for comments, questions or complaints and respond personally and appropriately. Be responsive and start conversations, and you'll be able to build a positive relationship with consumers. The IT networking company Cisco understands the importance of online engagement and offers its customers various avenues for interaction. In fact, the company claims it saved $200 million annually by moving its engagement efforts online. Cisco blogs, chats via Google+, has a full Facebook support page with more than 800,000 followers, uses LinkedIn and has even won awards for its customer support. Building this rapport and being within reach of your customers is important to building a reputation as a trusted brand. Whether you host a Q&A on Facebook Live, a demo on Periscope, or a webinar on your own website, live video events are a great way to build trust online. They require a lot of planning but can be very effective. There's something about the unedited aspect that really motivates interest. Customers can engage and ask questions while they watch. And as it's live, they know the answer they're getting hasn't been given a stamp of approval by the PR department, so it's a great way to build trust with fans. There's nothing like going off-message to destroy a brand. From your logo and brand colors, to your tone and personality, you must be consistent in everything you do and say. [Click to tweet ] A brand playbook can help you maintain the right voice, while brand management tools like Lucidpress can help your documents and content look consistent all the time, no matter how many people are on your marketing team. Consistency is also great for building brand awareness and recognition, as people will come to recognize your brand's unique style. Today, millennials in particular are using social media to discuss brands they like, and this can be important for companies looking to build trust. In one survey, 76% of millennial consumers said that content shared by average people is more trustworthy than what brands share. In another study, 92% of people said they trust the recommendations of other people, even ones they don't know, over branded content. User-generated content is a great opportunity for your business to show how real people are enjoying your products and build some serious brand trust. Make sure to share these endorsements on social—Starbucks is constantly doing this. You can also actively highlight this content on your testimonials page, blog or, like Zappos, create a specific destination for this content. Beyond your everyday customers, let other trusted sources advocate for you. You can highlight collaborations with other trusted brands, work with an influencer relevant to your industry, or share media coverage from reputable sources to build trust. Links are an important asset for any business as they connect your brand with the online world. Whatever link you're sharing, make sure it leads to a reputable website. Refer to fact-driven sources in your blog posts, industry favorites for your curated content, and always use branded links on social media so followers have an indication of what it is they're clicking on. Branded links are made up of a custom domain name and a keyword in the slashtag. By associating your links with your brand, users know it won't lead to spam or phishing sites and this increased trust can boost click-through rates by up to 39%. You should encourage your customers to provide reviews of your products or services online. Even a bad review can be used as an opportunity to testify to your company's transparency and demonstrate your responsiveness and willingness to turn that negative customer experience into a positive one. By encouraging reviews, your brand will show you care about what your customers think and are confident in the quality of what you're selling. Often, before committing to a purchase, consumers will check how your company is rated on Facebook, Yelp and other review sites. If they can see at a glance that you're close to a 5-star rating, they'll be converted in seconds. According to Forbes, millennials feel strongly about affecting change, and a lot of this is done online. They expect companies to be socially responsible, too, so if your brand is doing its part, make sure you let your audience know. Whether you're reducing your carbon footprint, taking steps to ensure gender equality, or raising funds for a good cause, share the news online. This will build your image as a noble brand that can be trusted by its customers. Providing compelling content, interacting with customers, and maintaining brand consistency is essential to building a brand that people trust. Today, your brand isn't simply what you say it is, but rather a reflection of consumer trust in your product or service. You have the ability to develop that trust online and turn it into a powerful marketing tool for your business. It takes work and planning, getting involved and interacting, but it has the potential to cultivate lasting trust that will build brand loyalty and benefit your business into the future. 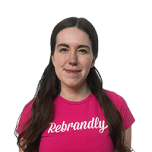 Louisa McGrath is a content manager at Rebrandly, the link shortener empowering marketers to put their brand on their links. She can be seen blogging around Dublin's city center, except on Sundays when she stays in to pore over the newspapers.